Because bowling epitomizes the perfect marriage of regalement and revelry as the only sport that grandiosely demands the following: a predominantly less-than amateur participation rate, shoes designed to make you feel foolish, controlled destruction using an otherwise dangerous object, and consumption of a little liquid courage is practically an official rule. Is The Goodnight affiliated with any other local businesses? Nope. 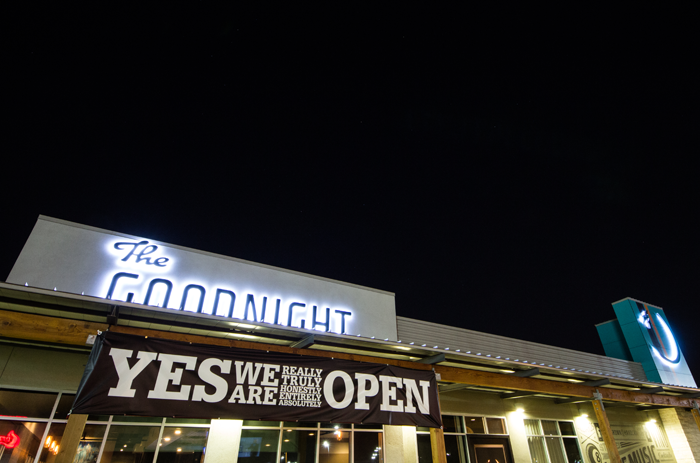 The Goodnight is an entirely independent venue with no corporate overhead to tell us to tone-down or turn-off the party. What makes The Goodnight one-of-a-kind? Our perfected balance of regal and revelry is what truly makes The Goodnight an experience like no other. Not only is The Goodnight all of your favorite cocktail complimented games, it’s also a culinary experience, and a place to take the Sunday Fun-day party well into the night. We managed to harness everything that made being a kid so much fun and revive it all with a dash of refinement. What is The Goodnight’s Age Policy? All ages before 9pm and 21+ after 9pm.